Last year, Senate democrats twice defeated House sponsored legislation to audit the Fed. It’s likely to pass this year, and Trump is likely to sign. The Hill reports ‘Audit the Fed’ Bill Gets New Push Under Trump. Controversial legislation to subject the Federal Reserve’s monetary policy powers to outside scrutiny is getting new life in Washington. Under the bill, the Fed’s monetary policy deliberations could be subject to outside review by the Government Accountability Office. Auditing the Fed is only a baby step. We need to end the Fed, end fractional reserve lending, and have a free market in currencies and interest rates. This is just slightly less politically astute than abolishing the ethics panel. Very few people care and it makes it look like settling political scores are top priority over tax reform, obamacare repeal, regulatory relief, etc. What political score would that be, Shamrock? The congresscritters that think the American people should be allowed to know what the banksters are up to have been trying to pass this bill for a very long time. Are you against transparency? It may be true most people don’t care, but then most people are pretty clueless. As my wife said as we were watching the interview with Assange Monday evening: “Most people probably don’t even know who Julian Assange is”. Pretty sad. Most people signed off on the User Agreement required to participate in Pokemon Go. They haven’t a clue as to what they’ve agreed to, nor who the actual counterparties are. Have you found an honest man yet, Diogenes? I have found an honest man. His name is Snowden. So true, diogenes. My friends have no clue they should be careful what they say in email, and have never heard of Snowden. Damn it! What is it going to take for everyone to understand that the ONLY way this works is if EVERYONE is ignorant to its machinations? If they expose the entirety of the illusion we all have come to accept as our “system”, it will most assuredly fail, as they ONLY thing that any system of any complexity can be sustained upon is CONFIDENCE, and we won’t have any of THAT if folks come to understand how it all works. It is the “mystery” inferring magical powers that allows us to consume more than we earn, import with no means with which to pay, and live forever with all medical bills paid by the illusory “others”. Why would we want to give all THAT up? Because “the math” says we eventually have to, and we are practically at that point. A voter and his money are soon parted. Mr Trump had best not go touring in Dallas in an open topped limo. Watch out for propaganda, comrade. The mainstream media are abuzz with claims that House Republicans have voted to “gut” or “eviscerate” the Office of Congressional Ethics (OCE), or to strip it of its independence. Perpetual House Minority Leader Nancy Pelosi (D-CA) claimed Republicans had “eliminated” the oversight body, and linked the move to President-elect Donald Trump, claiming that the House Republicans’ move represents a violation of Trump’s campaign promise to “drain the swamp” in Washington. The story qualifies as “fake news,” and the fact that it is being repeated by so many outlets does not make the it any less fake. First of all, the change — voted on by Republicans on Monday as part of their larger rules package — has nothing to do with Trump. The House sets its own rules, and it would actually be an encroachment on the separation of powers for Trump to tell it to do otherwise. Furthermore, Republicans have been in control of the House since 2011 and have left the OCE alone. What Republicans actually did was address two lingering criticisms of the OCE, which was created by Pelosi’s Democrats after they took the House in 2006 (and before she undermined her own promises to “drain the swamp” by taking advantage of her position to buy Visa stock, while softening regulation on credit card companies). The first criticism of the OCE is that it was too frequently confused with the House Ethics Committee, to which the OCE would refer complaints for further inquiry. NPR argues — in a news story — that the changes “weaken” the OCE. Rep. Bob Goodlatte says the changes “strengthen” it. For his part, Speaker of the House Paul Ryan disagreed with the way the new changes have taken place — i.e. outside of a bipartisan process — rather than the substance of the changes. But regardless, the changes do not “eliminate” the OCE, nor do they “gut” it. Moreover, criticism of the OCE has been bipartisan (though the case against it has not been clear-cut). What is not bipartisan is the media’s “fake news” approach to the rule changes, which is both exaggerated and agenda-driven. I just wanted to face palm over this OCE thing and Trump. Like really he is not even sworn in as president yet and they are blaming him? You just cannot make this stuff up anymore. The Fed should indeed be audited and as taxpayers we do have a right to know what is going on. We have a right to see the so called public’s gold in Fort Knox as well. Ending the Fed will not happen until the people of this country wake up. Good luck with “ending the Fed”…..WWIII in the financial world would begin unless they have layed out a long term program to do it gradually in small steps…..like Friedman proposed for lowering inflation over a long period of time. Today, we would have to do it to the debt markets—and growth would-could suffer for a long time. It will probably get quietly slipped into Harry Reid’s old desk drawer for safe keeping when nobody is looking. Cocaine Mitch McConnell will make sure of that. See Bill Still’s solution using UNITED STATES NOTES. How would we ever know what “growth” is if we never have a real economy from which to judge. It’s like asking a meth addict how he feels upon running out of dope. What we have to understand is that the growth that has been set upon us is mostly based on irrational exuberance, of a bubble mentality that creates distortions in the market that ultimately only a relative few prosper from. Everyone else just thinks they are getting ahead until the next “reset” and then are put about chasing down the next bubble. I will never understand why we accept this notion of “growth” other than in hopes of another bubble from which we might prosper. In my mind our growth should only reflect our actual population growth. Given that all metrics seem to be measured in dollars, the only way we can have their theoretical growth is if there are more dollars floating past the buck-o-meter. This can only happen if there are more bucks in motion which in part is driven by the number of actual bucks in existence. The fact that financial markets can “churn” existing dollars that have been created through actual production, appears to be another means of “simulating” growth. I don’t get it. Would we all simply starve if a percentage of our citizens just didn’t believe in easy money anymore? Or are these easy money addicts simply creating distortions that ultimately lead to loss for most of us. Ending the fed could be the road to hyperinflation. Hyperinflation does not come from printing money as so many people seem to believe. That belief would only make sense if the money had any value to begin with. But when the currency is intrinsically valueless already and whose trading value is only faith based, money printing is not the lead factor in the coming of hyperinflation. In a faith based currency, the value of the currency is related to faith in the issuing authority which is the fed. We may not like them but the world trusts them. The fed played lender of last resort to the world back in 2008 (which is what the audit will find and which is what Trump will claim to not like). But if the fed is shut down then who gets control of our money supply??? CONGRESS and TRUMP. Do you trust them to behave honestly or will they go on a shopping spree in order to further their political careers? It’s not ending the Fed but exposing the Fed that will crash the markets and create hyperinflation. The loss of confidence will bring it all down. Confidence is a perception, but needs some reality to sustain it. That reality has been completely erased and replaced with illusion that can very easily come crashing down. He can generally be counted on to be less of a bankster stooge, than tax feeders and other such riffraff. Sorry Eric but I could care less about the financial world. Why then are you reading & commenting on this (mostly) financial blog, michael? Don’t get me wrong, I support your right to be clueless. I think he probably meant to say that he does not care what happens to wall street bankers compensation bubble. I doubt that. Compensation for bankers in the US was very high long prior to the creation of the FED. John Pierpont Morgan put today’s bankers to shame. JPM went from rich to ridiculously so on account of operating as a de facto Fed (with attendant phone line to Washington), all the way until he couldn’t afford to any longer. Then, de facto was made de jure in the initial bailout of the Fed era. Bringing Yellen, and all the unelected arrogant bureaucrats of Washington DC, down a peg is a good thing in and of itself. She is not a sovereign, she is an employee — and a lousy insubordinate one at that. How many of the failed money center banks want to be audited by the central bank that helped get them into trouble in the first place? ZERO. There is no reason why Fed employees should think they are above the law. How many companies like getting audited by arrogant (and often corrupt) government officials? How many taxpayers (aka OBAMA’S BOSSES) volunteer for audits? Who cares if that arrogant group of pseudo-intellectuals approve of being audited. Put Yellen in handcuffs until she obeys the law like everyone else. Your being a bit of a drama queen James. In Brazil (just to name one third world banana Obama-like republic), Vale Rio Doce (the mining company) has a higher credit rating than the Brazilian government. Oil companies throughout the world have higher credit ratings than their host governments — and that is starting to be true even in 1st world European countries ( I am talking about credit spreads, not the meaningless Moody’s ratings). Uncle Sam is already defaulting on promises all over the place. Unless you are a clueless academic repeating the antiquated “risk free” mantra, US government promises are already very much in doubt. I PROMISE that actually ending the Fed will result in chaos in currency and other commodity markets.. I was a pit trader. To think that ending how the world banking system operates would be a seamless transition is utterly foolish. I promise that pit traders went the way of dinosaurs James. I also promise that the world got along just fine without central economic planners for centuries — go check a history book. And lastly, the deadbeats of the last few decades (the next generation will gladly pay you tomorrow, so the deadbeats can live beyond our means this generation!!!) is very very anomolous. Your warped debt based system is going to end because you are getting old and can’t afford to pay your existing debts before the grim reaper takes you away. Your debt binging world is ending, with or without the Fed. I know Bruce Krasting. Another man of the dinosaur era who thinks bailouts and debt are the answer to every question. He made his mark in the finance world after the fixed currency rates of Bretton Woods collapsed. Everyone said that would be the end of the world also — but the end of that central planning fiasco made Krasting a LOT of money and the world did not end. A new generation of traders will make lots of money playing the end of the Fed’s dominance. I don’t know if Washington will literally shut the Fed (or be forced to do so) — or if it will fade into Office of Comptroller of Currency irrelevance. Same thing unless you work in government. The Fed is the only organization that has the ability and authority to print trillions. And they have pretty broad latitude to do just that, as long as those trillions are traded for trillions in other financial instruments. I haven’t seen anyone saying that the Fed is just printing money and handing it out for free. So, I expect the Fed to get audited and found to have done everything perfectly legally. The problem is what is actually legal. And I don’t expect your average CongressCritter to be smart enough to do anything about it. There are certain black holes that need to be looked at … one would be GSE mbs (maiden lane another). The Federal Reserve currently holds about $1.75 trillion. How are those securities performing … and historically? Losses on those could be pushed back on the GSEs (but any large loss would trigger taxpayer bailout … which, er, fedgov would like to avoid). To my knowledge the Federal Reserve has never reported a loss of any sort. If true, quite amazing, no? I think, you answered your own question. If the FED holdings are mostly government or GSE bonds, these would have to default for the FED to make a loss. Ignoring government, a fair thing for the audit would be to presume the GSEs are free from government guarantee, and then mark the bonds to market. It is theoretical. James may be right. Just ending the fed and fractional reserving WITHOUT going to a gold standard would be worse than the current situation. It would mean money printing would be political. Imagine Obama, Harry Reid and Pelosi in charge of their own spending with no limits. The solution is hard money. Who prints it or how much is reserved is almost irrelevant. but if the crooks in Congress don’t repeal Obamacare quickly, its all going to be moot. Uncle Sam already can’t pay its bills, and is already defaulting all over the place. Go wait to death standing in line at a VA hospital if you are dumb enough to think the “full faith and credit of the US government” hasn’t already been violated. Quite the opposite; he indicated he thought it is not important at all, and just a political game. When your only means to obtain the funds required to avoid defaulting, is to rob people; you defaulting is always and everywhere a good thing. 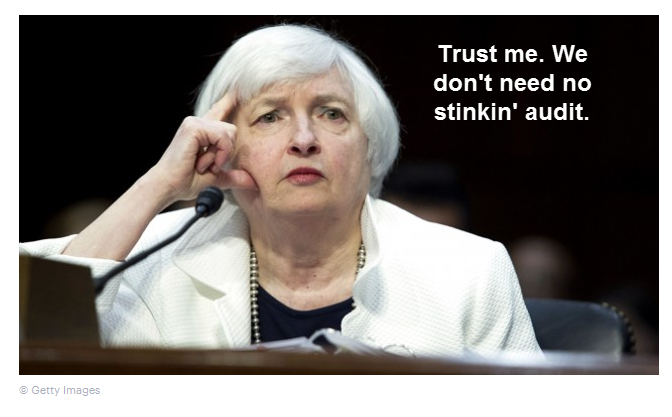 Mish, don’t know if it’s true but I read somewhere that Janet Yellen pays no taxes on her Federal Reserve earnings. Is that true? We the taxpayers have to pay our own commuting costs, pay our own home security costs, and pay taxes on cars, gasoline, alarm monitoring fees, etc. Yellen gets a DSS security detail (at least 2 heavily armored suburbans, with drivers, gassed up at government stations) twenty four hours a day. She gets all her errands run for her (for “security reasons”). And she gets a diplomat level security system installed in her home and monitoring paid for (on top of the 24hr security detail)… All this security is paid for by taxpayers (not the Fed). There was an article on Bloomberg a few years ago describing how upset her neighbors were about the security detail clogging up the street outside her house. The article said she lives in a gated community. The Fed itself pays for her lunch everyday, and breakfast / dinner a lot. Its a full meal made by a five star chef, not a deli sandwich like the taxpayers get. Fed employees get gold level medical insurance, and they don’t pay a cent for that. Not all audits created equal. Assuming the bill passes (for political points) … then the battleground moves to ground rules for audit … and who will conduct it. Back in 2009 when the TBTFs were audited for the stress test purposes … tens of $trillion of assets … a short time (a little more than a month, iirc) … a few hundred examiners. Get real … that was a sham. More than likely an audit of the Federal Reserve would be another sham. The weapons released into Mexico in the Fast & Furious program stand a better chance of being tracked down than Congress has of getting an accurate audit of assets on the Federal Reserve’s balance sheet. I don’t care who won the election, it ain’t happening. They found at least one of the guns sold in Fast and Furious… it was used to kill a federal agent about a year later. Not sure when they will “find” the others, or if the others are being used for the record killing spree in Obama’s home town Chicago. I think it would be great if the Fed got audited — just being audited (however fruitless) would be a huge hit to their oversized egos. Nixon got audited. Lots of members of Congress got audited. Its just arrogance that Fed employees think they are above the law. Will the auditors find anything? If they do find something, will they do anything about it? By the time Congress gets around to investigating things, its a lot like being on the cover of Time magazine. Your 15 seconds of fame are already up. Yawn, so what? Police use guns and drugs to do sting operations all the time. There’s always a risk that an operation an go bad and some of those things are not recovered. So what is the problem with a gun that got out in the open in Fast and Furious being used to kill a Federal Agent? Need I remind you that guns don’t kill, people kill. The people who get upset at Fast and Furious also believe in a nearly free and open market in guns. So if Fast and Furious never happened the guy who killed a Federal Agent would have simply purchased a different gun from a different source. It isn’t like we are talking about nuclear bombs, which there are only a few thousand on earth. We are talking about guns which are either close to or even exceed the number of people on earth. Eric Holder and Bozo Obama are the ones who think gun control is the solution, not a violation of the US Constitution (in spite of both of them claiming to have attended law school). The irony that two gun control advocates supplied the gun used to kill a federal agent (and probably a lot of the people murdered in Chicago too) is what makes the story funny. 3. start to put costs for environment destruction with toxic tuff so that China and India and other developing countries have to stop their idiocy, this happens with environmental parity tariffs that are HUGE if china continues current destruction of air, wter and land. 5. stop the insane refugee policies and asylum seeker policies. asylum seekers should be taken care of locally for example in Turkey for syrians with EU and USa just paying for TEMPORARY refugee camps and home return assistance once it is reasonably safe. 6. Demand labor protection parity from China and India with labor protection parity tariffs, if crappy labor standards then big tariffs. 8.stop the real estate bubbles and make houses and apartments places to live in and make them affordble by demanding that 30 year loan is the max and that the value of the house must be continually paid back so interest only loans and similars where one does not really pay back the loan are stopped. 9. cash-out refis to goose consumption temporarily have to be stopped. 11. stop the price-couging of americans by drug companies mandating that the price charged in america has to be the worldwide price because currently drug companies price-couge americans and sell the drugs for about half-price in Europe and for about a quarter of the price in Asia and Africa. For foreign made drugs the price of the drug can only be 2 times what it is in the country of origin so for example scorpion antivenom costing 100 dollars can be charged max 200 dollars in USA instead of the current 10,000 dollars. 12. Stop the monopoly like structures at hospitals and doctors offices (local monopolies) by making it free to open a hospital or doctors office or MRI-center or Maternity-service-provider where one wants provided the personnel is professional and educated. 13. Demand that all hospitals and doctors offices have posted prices for everything they provide and that the price is same whether paying cash or with healt insurance (with or without co-pays) so the person buying in cash gets the same price as the health insurance company. 15 make charging for procerudes not actually performed “go straight to jail” card for hospitals and doctors. We have a free market in currencies and interest rates. Anyone is free to exchange anything they have for any thing they deem to be a currency. And anyone is free to loan out anything they have and charge any interest rate they want, in any currency. The fact that no one uses gold for these things is not a bug. Ending fractional reserve banking is a misunderstanding of what banks do. Banks “monetize credit”. They take your credit (reputation, assets, job standing) and turn it into debt in exchange for cash. In exchange for assuming the risk of non-payment, they get to “create money out of thin air”. That’s what they have always done. We’ll have a free market in currencies when anyone is free, and equally free, to increase supply in order to meet demand. When massa was the only one allowed to distill alcohol, there was no free market in booze. Meanwhile – Deutsche Bank’s Financial Crimes Overseer is stepping down after only 6 months. They won’t let him have sufficient staff. The big problem is not fractional banking It is transactional banking, market manipulations, and congressional fraud/irresponsibility (caused by career politicians). The real problem is the government. The FED was created to do X. Woodrow Wilson then forced it to to do Y, to support federal debt for his WW1 spending. The FED has never been the same as it’s original purpose, since. I don’t know the details, but i remember having read, “Truman ended FED independence in 1951.” More government meddling. Mish, are there any countries on earth that don’t have fractional reserve banking? Can a bank even exist without it? I’m trying to picture what that would even look like. Obviously they couldn’t lend out deposits, but rather only their own equity. To support the building, rent, etc, they would have to charge much higher interest rates, and also convert to making money primarily off of fees, since the volume of loans would be only 1/10 as much, or less. I’m guessing that most people wouldn’t be able to qualify for loans, and most couldn’t afford to have a checking account or debit card, so it would force a move back to more of a cash-based economy. Could be wrong but they would simply not lend out deposits. A ‘bank’ would borrow $100B and then make loans out with that $100B. The borrowed $100B would effectively be a deposit During 2008 a lot of the crises was not so much deposit taking banks but ‘shadow banks’ that act like banks but never fall under the regulation of banking since they are technically not taking deposits but borrowing money from investors. Pretty much all banks will eventually try their hand at lending out some deposits. Then occasionally fail. Resulting in their principals being tarred, feathered, stripped of all they own including wife, children and life, during the occasional panic. That is as it should be. The problems arise once the government steps in to confiscate the property of 3rd parties, whether by taxation or debasement, in order to prevent the above resolution from running it’s course. Doesn’t work. Banking crises have a habit of harming 3rd parties. The 19th century was a history of one crises after another even though no one thought the Federal gov’t would bail out banks that crashed. 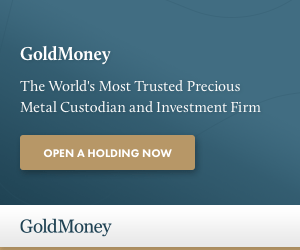 I’d like to see the mechanism by which a bank failing in New York, would end up reducing the amount of Gold under my mattress in Wyoming, back then……. Or heck, per more real world concerns, how it would reduce the amount of purchasing power represented by that gold. As far as I can tell, the reduced ability of 1st and 2nd parties from New York to bid against me, would in fact _increase_ my gold’s purchasing power…… Strongly encouraging future New Yorkers to be a bit more careful, about where they choose to store their savings. Hence helping the financial system to become more robust and less prone to failure. While simultaneously discouraging ambitious young men from believing the way to make a fortune is to be nothing but a bankster, instead of doing something useful with their lives. So what. Please would someone give me a major change which took place after a GAO audit. This is politics as usual. You audit, you point finger, you have hearings then you do nothing. If the Justice Dept and regulators are not going to enforce existing laws, and prosecute existing frauds, what good is auditing the Fed? The Fed’s biggest customer is the big banks, who have the most money to bribe. Throw in the fact that the NSA spends half their time collecting content to bribe powerful people (the other half is spent hunting money), and nothing will get done until short term-limits are imposed, which can be done by voting out EVERY incumbent, EVERY election until an Amendment is passed. Simply stop paying interest on what the govt spends, and stop buying govt debt to stimulate, and instead by corporates, as was the original intent before WWI. Again, who is going to force the changes with bought and paid for career politicians? First and foremost: disclosure. Obviously they are hiding things they don’t want the public to see, because they have been doing everything possible to avoid an audit for decades. That’s why it will never happen. As soon as the public sees it, they will realize that the king has no clothes. Well why don’t we audit Fort Knox? Do we still own all the gold r not assuming it’s still there. Why don’t we audit Fort Knox to c if we still own the gold assuming it’s still there? I always felt it would make for a great campaign stunt for somebody like Rand Paul. The duly elected and sworn US senator from Kentucky standing outside the main gates to Fort Knox, demanding to be allowed entrance to see and give at least an eyeball audit of the national bullion depository. Never happen. It just won’t. Why does everyone want to end the Fed? I understand the problems with their FOMC and economy and interest tinkering. But isn’t their other role of regulation and subervision of banks an important function? Shouldn’t this remain outside of the federal government bureaucracy. In fact alll financial rules and regulations should be with the Fed and not the federal government. Take the SEC, FDIC etc and place them with the Fed. Not to mention they also clear a lot of trades. End fractional reserve lending? And what would mortgage rates be in your imaginary world? Why would anyone care? When one can buy a house from cashflow, why the obsession with fellating banksters and other useless denizens of the real estate rackets? I hope the Republicans eliminate inflation. Deflation is such a blessing for shoppers. The senate won’t pass. the republican party is still controlled by the banksters. I think the FED should be audited, but there’s a huge difference between that and ending the FED. The FED does a lot more than setting rates. Necessary stuff that would have to be done one way or another. Alright, so say the Audit the FED happens. Has anyone of you ever considered, after all these years, that the FED wouldn’t have a plan B, just in case this ever came to fruition? I don’t mean as in we’ll do this now since you found us out, but more like an already scripted out response and faked review of current accounts? With the threat over their heads becoming clearer every day, they have this figured out and will give the public whatever will appease the play it safe crowd AND the ones who know they’ll find dirt. Literally, you can bank on this being the way it’ll go down.